In this series, we're going to show you lots of ways to improve your rhythm playing. We'll be inventing new chords, reinvigorating old ones and deconstructing a few tired old cliches. ...and everyone just trudges through with big clumpy barre chords, like bulls in a Mississippi china shop. It's a shame that blues is seen as the poor man's jam-session staple, but it's hardly surprising when you hear what some people do with it! But there's so much you can do to make it cool. One problem is that the chords are big and unwieldy, but they don't have to be. Any 'dominant' 7 chord has four notes: root, major third, fifth and minor seventh, but as you'll see below, common guitar barre shapes have doubled notes, which we don't really need. It's very common to omit the fifth completely in chords with at least one extension (such as the seventh) so let's get rid of that. We'll also use the E7 shape for the D7, so that leaves a couple of three-note shapes which sound great and are very mobile. But let's assume we have a bassist. Why are we even playing the root, when the bassist has that covered? 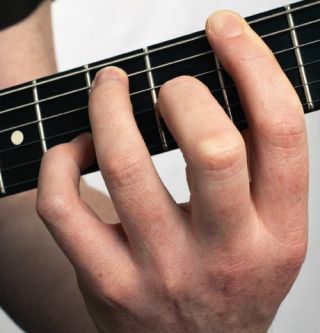 For a guitarist, the only truly vital notes you need to use in any 7 chord are the third (to show whether it's major or minor) and the seventh itself. That gives us ultra-funky two-note shapes and our work here is done!